On New Year’s Eve 2011, I had a gathering at my house. Most of the people present that night, with a few exceptions, live on the 3400 blocks of Pierce, Fratney or Bremen Streets. I’m not certain how we got on the subject, but at one point we realized that nearly everyone in my livingroom was a public employee. I don’t know how the demographics ofthese northernmost blocks of the neighborhood compare with Riverwest as awhole. But it’s for sure that public employment pays the bills for asignificant number of households in our corner. My guests that night work for(or retired from) the City of Milwaukee, Milwaukee County, the State ofWisconsin, MPS and UWM. New Year’s Eve seems to belong to adistant era now. There’s “Before the Bill” and “After the Bill”. 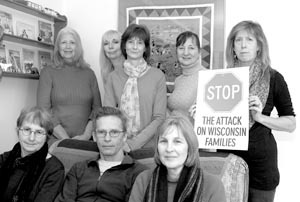 As I writethis today, the battle over Governor Walker’s budget, and his destruction ofour collective bargaining rights, has raged for well over a month and consumedmuch of my time and energy, as well as that of my neighbors and friends. So – are the public employees in ourneighborhood pampered fat cats – the “haves” of Wisconsin, blood suckerspreying on the rest of you? Meet my neighbors and me, and decide for yourselfhow we fit into the economy and social fabric of Riverwest. I – Sue Blaustein – hosted the party.I’ve been in Riverwest almost ten years, and have owned my home on Booth Streetsince 2002. I’ve worked for the Milwaukee Health Department as a food safety inspector for20 years, and worked a year at the Linnwood Water Purification Plant beforethat. I’m a member of AFSCME Local 1091 andserved in various executive board offices from 1993 to 2009. As an AFSCMEVolunteer Member Organizer, I took several leaves of absence to organize homechildcare workers. I know how much hard work it takes to build a union and runone, so the passage of the “Budget Repair Bill” is especially bitter to me. Each year through the City CombinedGiving and Visions Campaigns, I donate to the Urban Ecology Center, Milwaukee PublicLibrary and Milwaukee Public Schools Foundations. I also participate in theannual Woodland Pattern Poetry Marathon (and the 3400 block crew always comesthrough with donations). If you stop by the Urban Ecology Center’sclimbing wall, you may find retired city electrician Dennis Mack helping UECstaff belay children visiting the Center. After 27 years of installing andrepairing streetlights, Dennis retired this past summer. A member of theInternational Brotherhood of Electrical Workers (IBEW), Dennis bought his home onAuer Avenue in 1997. You’ll often find him settling in at Alterra with a book. Since retiring, he also volunteers timeas a librarian at Maryland Avenue Montessori School, where his partner Christine (aFratney Street homeowner) is a veteran teacher and member of Milwaukee TeachersEducation Association. Chris and Dennis are members of Riverwest Yogashala too. Recruiting friends and neighbors to workon community projects is a pattern here. Suzanne Zipperer, a 23-year Riverwestresident and Pierce Street homeowner works for the Bureau of Milwaukee ChildWelfare, a state job, as a Communication Specialist. Her union is the WisconsinProfessional Employees Council #4848. Suzanne writes for the Currents and recruited me to dothe same. When she got the idea for the first Riverwest Secret Garden Tour(which, after two successful years, is on its way to becoming an institution),she recruited Pierce Street neighbor and UWM academic staff member Carol Lordto help. She also tapped me, and neighbor Linda Rosland, (another UWM employeeand WEPEC member) to assist at the Bureau’s Christmas party for foster childrenand parents last December. Suzanne also helps the Urban EcologyCenter publicize the annual Farmer Open House and was block club president.Both she and Linda have rental units and they try to use contractors in theneighborhood when they need work done on their houses. Linda’s an Administrative TelecommSpecialist and has worked at UWM for 22 years. Carol (whose husband Ed is a DNRemployee) teaches English as a Second Language there, as does Bremen Street’sPat Goldstein. Fratney Street’s Cathy Kaye also works in the ESL program. Allthree have been involved in the American Federation of Teachers (AFT) drive toobtain collective bargaining rights for UW faculty and academic staff. Allthree are predictably disgusted to see their hard work undone. Most of us have already trimmeddiscretionary spending, since we’ve had furlough days for two years. All thepublic employees who toasted 2011 with me are acutely aware that with the deeppoverty in Milwaukee, there are many far worse off than us, even after our paycuts. However, none of us sees how the destruction of our unions and benefitsin Walker’s budget will lead to improved opportunities for other Milwaukeeresidents, particularly considering changes to the Homestead Credit, EarnedIncome Credit, Badger Care and Wisconsin Works programs. At a March 14 Town Hall Meeting atShorewood High School, Jack Norman, of the Institute for Wisconsin’s Future,informed the large crowd that there are 48,379 public workers in MilwaukeeCounty. He has calculated that each (including me and Chris, Linda and Suzanne, Carol and Pat) couldlose up to $3,195 in take-home pay under this budget. He further calculatesthat those cuts will lead to a $154.5 million dollar reduction in local buyingand economic activity. I spend most of my money between downtown(where I work) and East Capitol Drive, with forays into Shorewood. I’m anOutpost owner and frequent shopper there. Members of the 3400 block crew shop atOutpost, Alterra, Bliffert, the Art Bar, Café Corazon, Nessum Dorma, Piggily Wiggily,Woodland Pattern, the Tracks, Riverwest Gardeners Market, Shalem Healing andother neighborhood businesses. One of the great things about Riverwestis that it’s a walkable neighborhood, with lots of opportunities for low budgetrecreation and entertainment. Belt-tightening is not as painful here as itcould be elsewhere. But our small businesses are an asset, and each time weforgo a night out, a dessert or a coffee; or defer a home project, they andtheir employees will end up “sharing the sacrifice”. Now you’ve met some of the publicemployees in your midst. We’re neither angels nor devils, but we’re taxpayers,voters, volunteers and consumers, and most of our money circulates right here.